Chest wall tumours are rare among infants, and only 1.8% of solid tumours in children occur in the chest. Very few of them are congenital fibrosarcoma (CFS). CFS is the soft tissue sarcoma (STS) of which only 60 cases are documented as congenital. , Thus, because of rarity of cases and lack of clinical experience, diagnosis and treatment are challenging. CFS is known for its properties of extensive local invasion, but rare distant metastasis. Distal extremities are the usual location of involvement. ,, The chest wall has been mentioned as the location for CFS only rarely. Prognosis of CFS of the chest wall is poorer when compared to CFS of distal extremities. , Here, we report a case of a large CFS of the chest wall. A full-term male infant born by normal vaginal delivery was referred to our department from the nursery attached to the obstetric department of our hospital, with a large mass arising from the left lateral surface of the chest wall. His birth weight was 3250 g and the Apgar score at 1 and 5 min was 8 and 9, respectively. On examination, a 10 Χ 10 cm solid, lobulated, non-tender mass was found arising from the region of the left lateral chest wall lateral to the left areola and below the axila [Figure 1]. It was not fixed to the chest wall and was mobile in all directions. A complete blood picture was significant only for leucocytosis (18,400cells/mm 3 ). The chest radiograph did not show any bone deformity. The ultrasonogram (USG) showed it to be a hypoechoic solid mass. USG of the abdomen was normal. A wide local excision was done under general anaesthesia. An incision was given around the tumour taking adequate margins. A plane was easily developed between the tumour and the chest wall by blunt and sharp dissection. An area of skin directly covering the tumour was removed along with it. A mini-vacuum drain was left in the area and the wound closed in a single layer with Nylon 3-0 suture. 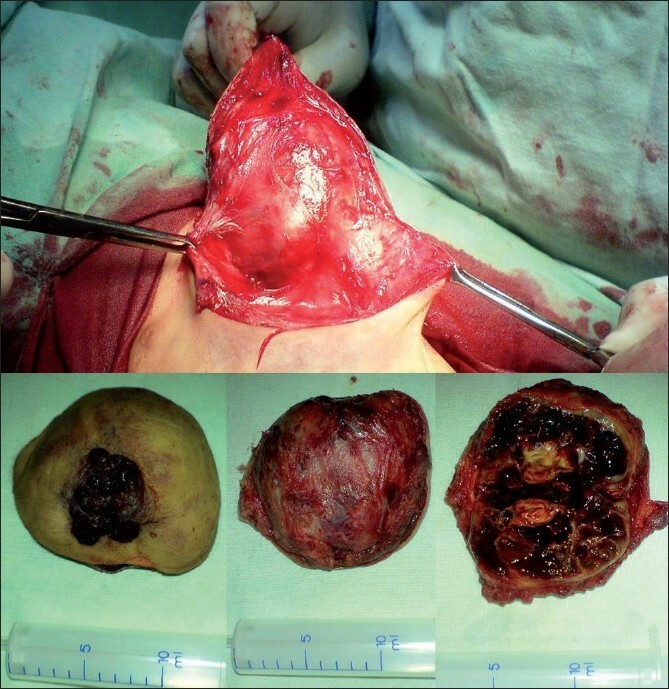 Grossly, the tumour was well circumscribed, with the cut section showing multiple areas of haemorrhages and necroses [Figure 2]. Microscopically, it revealed bundles of connective tissue and fibroblast cells in fascicles [Figure 3] with mitotically active tumour cells that also showed nuclear pleomorphism. The margins of resection were free of tumour. 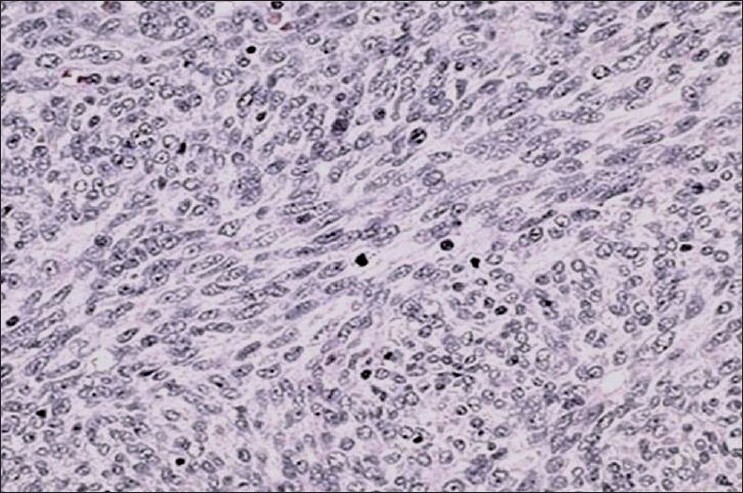 The tumour was positive for vimentin and actin, and negative for S-100. A diagnosis of CFS of low-grade malignancy was confirmed on histopathology. The immediate post-operative period was uneventful. From the age of 6 months to 2 years, the child had multiple episodes of upper respiratory infections. He succumbed to multiple lung metastases after 2 years. CFS is rare, soft tissue, locally aggressive tumour, which presents a diagnostic and therapeutic challenge. While CFS on extremities may have favourable prognosis after complete resection, CFS on rarer axial sites like chest wall carry poorer prognosis. 1. Parra Gordo ML, Soleto Roncero MJ, Terriza Rueda MD, Marcuello Olona P, Mariρo Espuelas JM, Castaρo Pascual A. Congenital fibrosarcoma of the chest wall. An Pediatr (Barc) 2004;61:565-7. 2. Lam PM, Leung TM, Ng PC, Vlantis AC, Wong W, Lau TK. Congenital cervical fibrosarcoma with hydrops Fetalis. Acta Obstet Gynecol Scand 2004;83:773-6. 3. Miura K, Han G, Sano M, Tsutsui Y. Regression of congenital fibrosarcoma to hemangiomatous remnant with histological and genetic findings. Pathol Int 2002;52:612-8. 4. Chung EB, Enzinger FM. Infantile fibrosarcoma. Cancer 1976;38:729-39. 5. Soule EH, Pritchard DJ. Fibrosarcoma in infants and children: A review of 110 cases. Cancer 1977;40:1711-21. 6. Blocker S, Koenig J, Ternberg J. Congenital fibrosarcoma. J Pediatr Surg 1987;22:665-70. 7. Vinnicombe SJ, Hall CM. Infantile fibrosarcoma: Radiological and clinical features. Skeletal Radiol 1994;23:337-41. 8. Arceci RJ, Weinstein HJ. Neoplasia. In: MacDonald MG, Mullett MD, Seshia MM, editors. Avery's Neonatology pathophysiology and Management of the Newborn. 6 th ed. Philadelphia: Lippincott Williams and Wilkins; 2005. p. 1455-6. 9. Enzinger FM, Weiss SW. Soft tissue tumours. St Louis: Mosby; 1995. p. 231-91. 10. Arndt CA. Soft Tissue sarcoma. In: Behrman RE, Kliegman RM, Jenson HB, editors. Nelson Textbook of Paediatrics. 17 th ed. Philadelphia: Saunders; 2004. p. 1714-7. 11. Kothari KC, Pandey M, Wadhwa MK, Patel DD. Congenital infantile fibrosarcoma. Eur J Surg Oncol 1999;25:94-6. 12. Shamberger RC, Grier HE. Chest wall tumours in infants and children. Semin Pediatr Surg 1994;3:267-76. 13. McCarville MB, Kaste SC, Pappo AS. Soft-tissue malignancies in infancy. AJR Am J Roentgenol 1999;173:973-7. 14. Okcu MF, Hicks J, Merchant TE. Non-rhabdomyosarcomatous Soft Tissue Sarcomas. In: Pizzo PA, Poplack DG, editors. Principles and practice of pediatric oncology. 5 th ed. Philadelphia: Lippincott Williams and Wilkins; 2006. p. 1055-6. 15. Weiss SW. Congenital and Infantile fibrosarcoma. In: Enzinger FM, Weiss SW, editors. Soft tissue tumours. 4 th ed. Missouri: Mosby Elsevier; 2001. p. 377-9. 16. Kodet R, Stejskal J, Pilat D. Congenital-infantile fibrosarcoma: A clinicopathogical study of five patients entered on the prague children's tumour registry. Pathol Res Pract 1996;192:845-50. 17. Luchtman-Jones L, Schwartz AL Wilson DB. Hematopoietic Problems in the fetus and Neonate. In: Martin RJ, Fanaroff AA, Walsh MC, editors. Fanaroff and Martin's Neonatal Perinatal Medicine: Disease of the fetus and Infant. 8 th ed. Philadelphia: Mosby Elsevier; 2006. p. 1343-6. 18. Rosai J, Ackerman LV. Surgical Pathology. 9 th ed. Newyork: Mosby Elsevier; 2004. p. 2253. 19. Trφbs RB, Meier T, Bennek J, Heinrich S, Willnow U. Fibrosarcoma in infants and children: A retrospective analysis- overdiagnosis in earlier years. Pediatr Surg Int 1999;15:123-8. 20. Kurkchubasche AG, Halvorson EG, Forman EN, Terek RM, Ferguson WS. The role of preoperative chemotherapy in the treatment of infantile fibrosarcoma. J Pediatr Surg 2000;35:880-3. 21. Yalηin B, Leblebicioglu G, Gόler E, Gedikoglu G, Kutluk MT. Congenital infantile fibrosarcoma of the thigh in a newborn. Tumouri 2001;87:436-8. 22. Madden NP, Spicer RD, Allibone EB, Lewis IJ. Spontaneous regression of neonatal fibrosarcoma. Br J Cancer Suppl. 1992;18:S72-5. 23. Pousti TJ, Upton J, Loh M, Grier H. Congenital fibrosarcoma of the upper extremity. Plast Reconstr Surg 1998;102:1158-62. 24. Demir HA, Akyuz C, Varan A, Ergen FB, Buyukpamukcu M. Right foot congenital infantile fibrosarcoma treated with chemotherapy alone. Pediatr Blood Cancer 2010;54:618-20.